It is July 21, 1861 and the first major battle of the American Civil War is raging near Manassas Virginia. The Union forces have the upper hand and the Confederate lines are beginning to crumble. Standing on top of Henry House Hill, ready to reinforce the southerners, is Confederate General Thomas Jonathan Jackson. In the middle of the chaos and panic he is standing tall with out the slightest sign of fear. He and his brave troops will soon spring into action and help secure an amazing victory over the Northern troops. 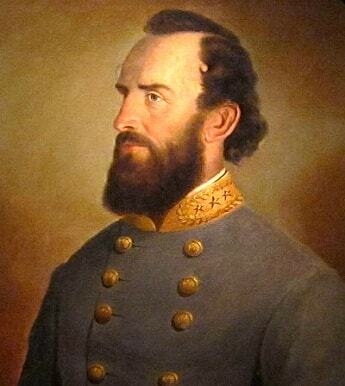 In fact it is the day his bravery under fire will earn him his famous nickname "Stonewall Jackson". Click here for a great selection of Amazon.com books about General Stonewall Jackson. History has rarely seen such a confident and capable military commander. His name is familiar to any kid who has ever opened a history book. On this page of Civil War General Facts you will find a list of interesting information about this great Civil War general. There is actually a controversy about the circumstances of how Jackson earned his famous nickname "Stonewall". At the First battle of Bull Run while under heavy fire from Union forces and desperately trying to re-form his collapsing lines Confederate General Barnard Elliott Bee shouted out "There is Jackson standing like a stone wall". Almost immediately after uttering these words he was shot dead. The controversy lies in what Bee meant by his words. It has been generally accepted that he was trying to encourage his own men to stand strong like Jackson was. However it has been suggested that Bee was angry at Jackson for holding back (which were his orders) and not coming to his immediate aid. He was born January 21, 1824 and had a rough childhood. His mother became ill and eventually died while he was young. He was sent to live with various family members during his youth, some of who did not treat him nicely. He was mostly self-taught attending school when possible. In 1842 he attended the United States Military Academy at West Point in New York. Here he displayed the determination that he would later show as a military commander. He quickly made up for the disadvantage of a poor education and every year rose in the academic standings. After graduating from WestPoint he was sent to fight in the Mexican-American War where he was eventually promoted to the rank of major. Starting in 1851 he taught at the Virginia Military Institute (VMI). By all accounts he was not a very good instructor and was disliked by his students. When the American Civil War broke out Jackson was a colonel and he was put in charge of training new soldiers. He was promoted to brigadier general in June of 1861. He took command of several Virginia Infantry regiments which would become known as the "Stonewall Brigade". On May 2, 1863 during confusion at the battle of Chancellorsville he was accidentally shot by his own men. In attempt to save his life doctors amputated his arm; he caught pneumonia and died eight days later. His death hurt the Southerners morale and deprived the confederate army of one of its greatest leaders.